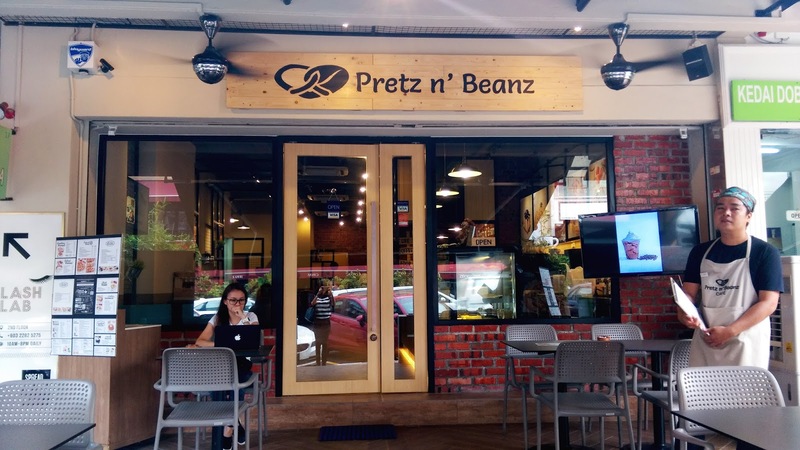 Prezt n' Beanz A Must Try! Hye there! Are you a fan of pretzels? Do you have a favourite preztel? I think I just found a new place that sells Yummy and Healthy pretzels! You can get your tummy satisfied at the Pretz n' Beanz! 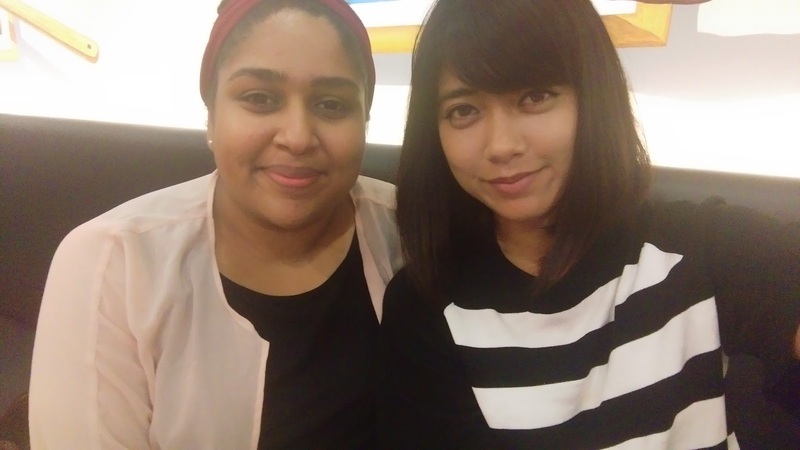 They just recently opened a new outlet at Bangsar, since 15th April 2016. This place definitely has that industrial feel to it, but it does feel very cozy. Don't worry, Pretzels aren't the only thing that they are good at making. They have pretty much an all-rounder set of meals to go for the entire day! Here's their menu! Told you right, they can keep your taste buds rocking all day long! 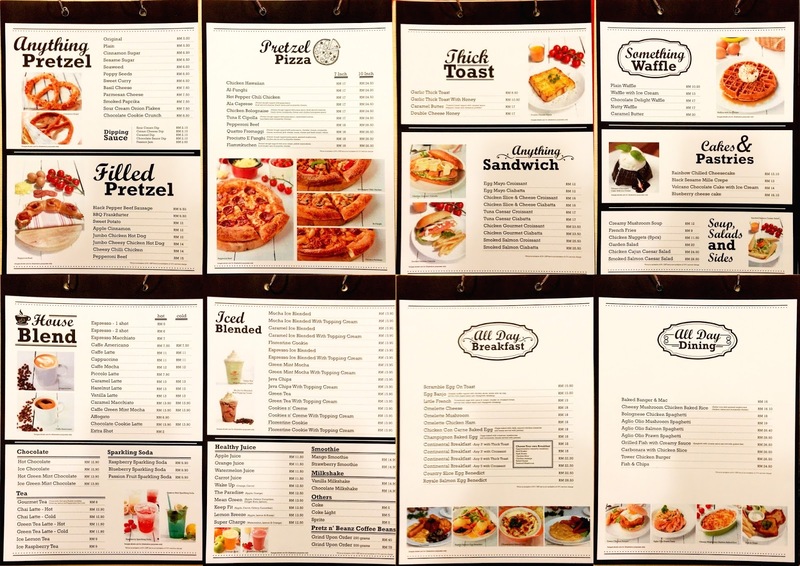 While going through the menu, Priyanka and me, we picked out any food that stood out and of course we didn't miss eating their famous pretzels. While we were sitting around and waiting for the food to arrive, Aimman, one of the staffs of Pretzel n' Beanz, gave us a little background check of the company. What actually caught my attention, was their logo introduction, because I found that it was very cute yet it totally had a beautiful meaning behind it. tied together in a heart shape, that expresses their love and passion for both pretzel and coffee. this expresses love for human race. Pretty deep huh? The color orange radiates warmth and happiness, combining the physical energy and stimulation of red with the cheerfulness of yellow, it expresses LOVE LIFE attitude. Honestly, I didn't notice the ren word, because I thought it was just the pretzel, but once I saw it as “人”, I can't un-see it now. From a designer's point of view, I should learn from this, combining aesthetics with deep meaning behind it. Somehow, it feels like a 'chi'. A good energy source. Within 10 minutes, all of our orders started to fill up our table. Oh, don't worry, if your food does get cold, while you were busy chatting and eating away, you can always ask to reheat it. They have a bunch of really friendly staffs there. The drinks came in first, because Priyanka and me are sort of the soda-kind-of-people, we both ordered the Passion Fruit Sparkling Soda (left) and the Raspberry Sparkling Soda (right). The Passion Fruit sparkling soda tastes exactly like how it tastes when you are eating the passion fruit at the seeds area. 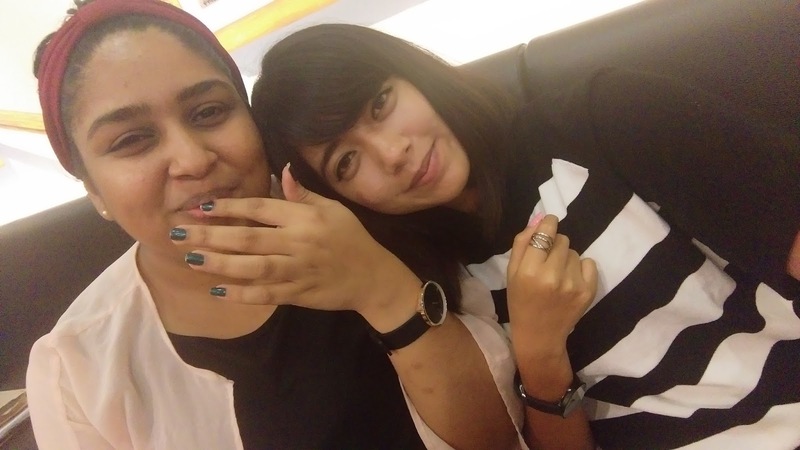 It was a very familiar taste, we both agreed instantly on that how it literally tasted like. I would definitely recommend the Raspberry sparkling soda, if you are looking for a booster like feeling, as it really freshens you up with each sip. Rather than tasting just like a raspberry juice, it actually tastes like a mixture of berries. Both drinks cost RM9.90 each. 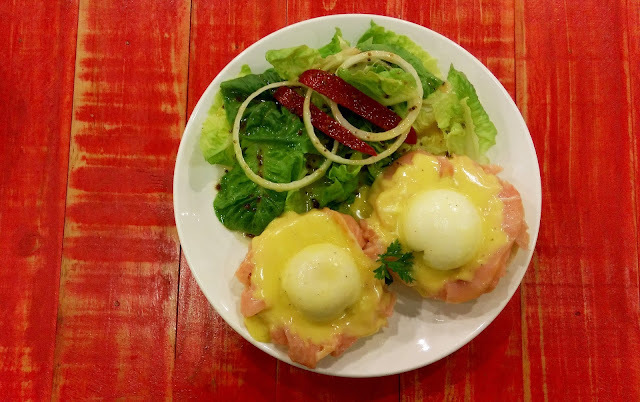 Then came along, was the Royale Salmon Egg Benedict. I am absolutely not going to lie to you, this plate right here, won both Pri's and my taste buds and hearts! The taste of everything on this plate just fused too well. Really wasn't expecting, the egg to be like a lava and the taste of each salmon strip was just heavenly, and mouth watering. You can actually taste that seasoning while enjoying the salmon with the runners(yolk) from the egg. I wouldn't be surprise if this becomes my go-to-meal when I am at here. 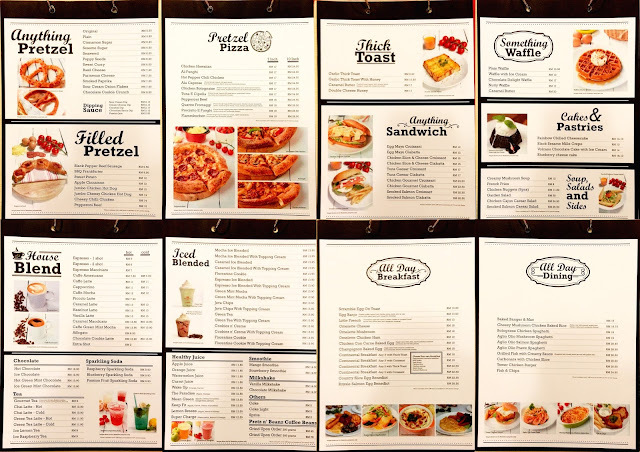 You'd probably thinking that I am over-exaggerating this menu here, but I have a short clip video to prove my point. This meal costs, RM28.50. 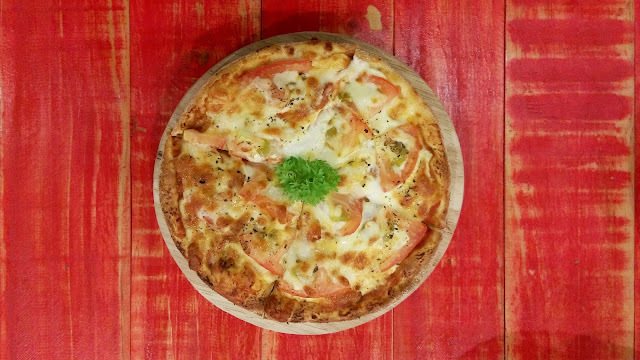 Next, was the Quattro Fromaggi, its a pizza made out of pretzel dough, served with pizza sauce, cheddar cheese, mozzarella cheese, monterey jack cheese, cream cheese and freshly sliced tomatoes. Surprisingly, even with the amount of cheese that is on this pretzel pizza, it doesn't feel heavy, in fact, it tastes like you were eating something totally healthy. It's safe for me to assume that the tomatoes gave that fresh touch to it. The dough itself, felt very light to the taste buds, though it wasn't actually a very thin slice either. Two thumbs up for this dish as well! This beautiful pizza right here, costs RM18 (for a 7inch pizza). After that, was the arrival of their famous pretzels. Generally, the pretzels did take sometime to reach to us. But it was still within the first 10 minutes. This was just because, they freshly bake the pretzels once you have ordered for them. Best part of their pretzels, is that they are only baked. Unlike, Aunty Anne's where they fry the pretzels, which gives of a much heavier taste to it. We ordered the Cinnamon Sugar (left) and Parmesan Cheese (right) pretzels. It definitely tasted healthier than most of the pretzels that I have eaten. You wouldn't get the taste of extra sweetness like as if someone accidentally dropped a cup of sugar into or onto the pretzels. The cinnamon sugar, was very authentic, you know how it smells like when you are literally sniffing on the cinnamon sugar stick? That's exactly how it tastes like. It doesn't have that trace of 'fake' sugar. For the parmesan cheese, it wasn't too cheesy. Just the right amount of cheese powder sprinkled on the pretzel. I would say it's very light for the taste buds. 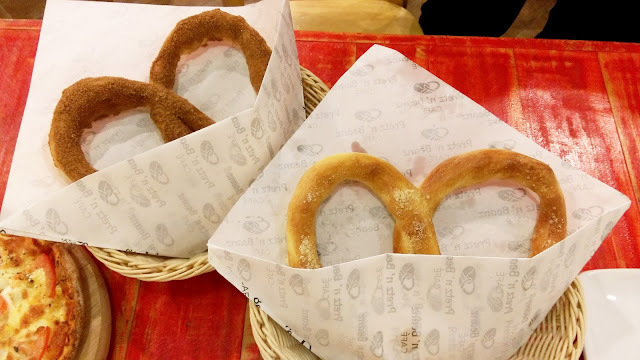 The cinnamon sugar pretzel costs, RM6.50 and the Parmesan Cheese cost RM7.50. If I am comparing this two pretzels, the cinnamon sugar pretzels takes the win, as its more flavourful. I am a person which prefers an explosion to happen in the mouth rather than subtleness. I think it's an eating habit that I am unable to get rid of, since I have been trained well to eat curry by my late grandma. 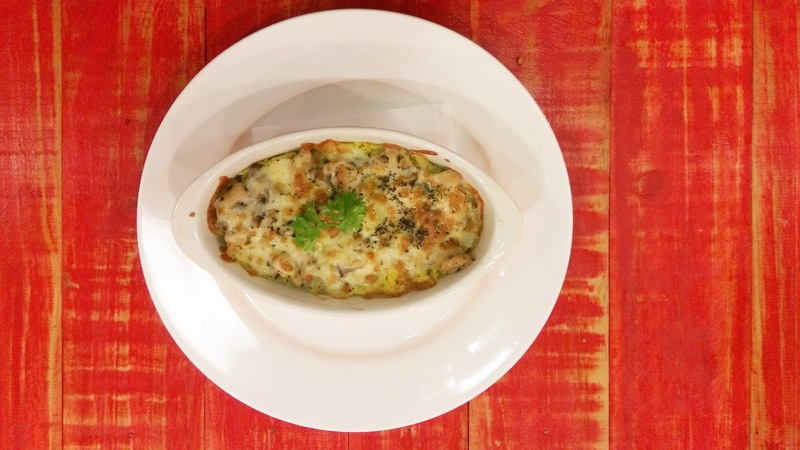 For our final meal, we ordered the Cheesy Mushroom Chicken Baked Rice. By the time, we reached this meal, it was a little bit cold, but we did manage to reheat it. Don't worry, the reheat process didn't make the rice hard. Which also came off as a surprise to me, because as far as I know reheating this kind of food will definitely affect the insides. Priyanka wasn't able to enjoy this, because she was already full. So, I had the honors to finish it up. Every mouthful was popping with flavours. Some bites were filled with cheese purely melting in your mouth, then you have the chunks of chicken and mushrooms ever so often kicking in your taste buds. It was definitely, a wondrous dish! This dish costs RM 16.10. 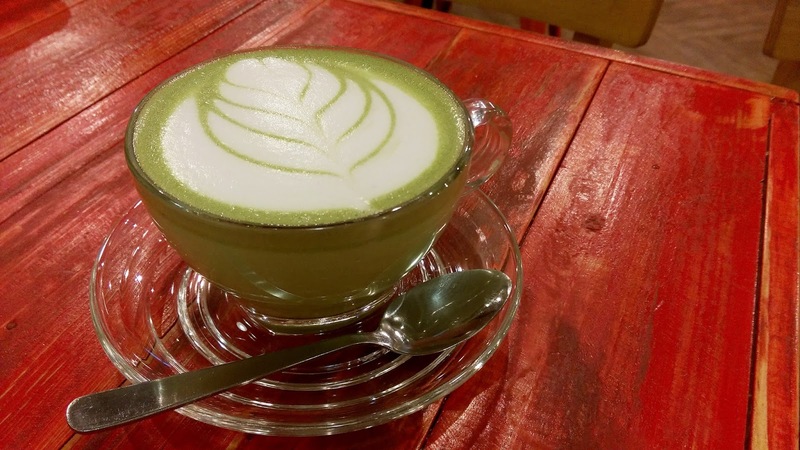 Oh, before I forget, they also did serve us with one of their signature coffees, Green Tea Latte. According to Pri, the foam was very flooof, it had a very smooth taste to it. The drink itself, was strong in its flavour but not too overpowering. 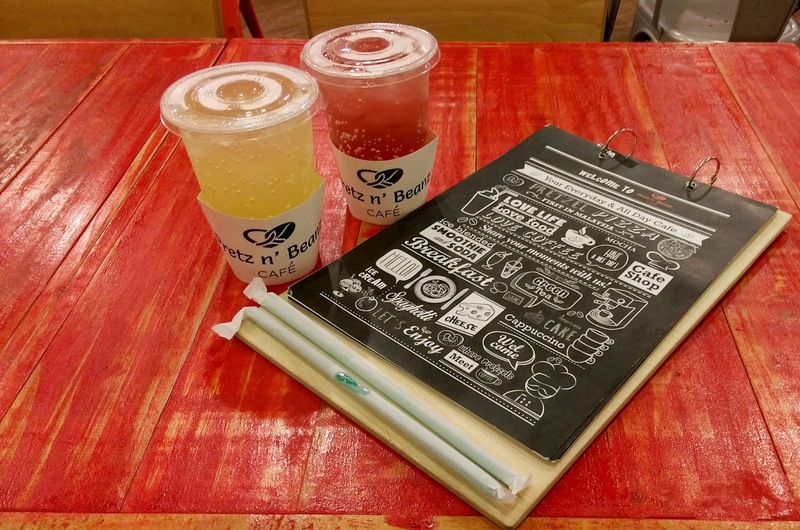 A highly recommended drink for you, if you come here to take a breather and just relax. This was what I remembered when I asked her, how did it taste like. For a person, who isn't really fond of coffees, I would say Pri actually did enjoy this cup of coffee. Finally, I will end this post with another video. Hope, I did get your taste buds wondering. Do pay a visit to their new outlet in Bangsar or the one in Solaris. Till the next post, take good care! 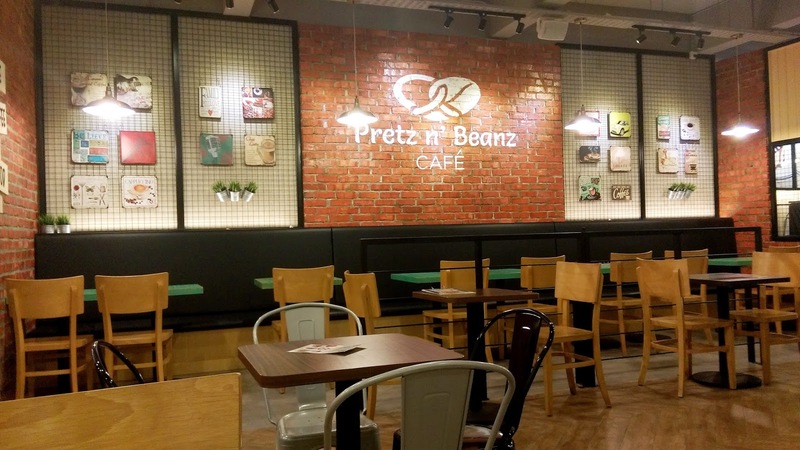 And have a good meal at Pretz n' Beanz! it is chris...seriously when you are down in malaysia let me know k?